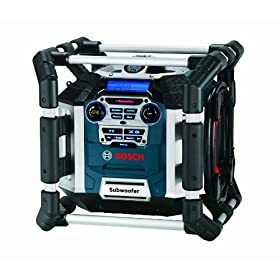 Surround yourself with premium 360-degree stereo sound with the Deluxe version of the Bosch PB360D Power Box 360 job-site radio, which offers a high performance, weather-resistant system that produces up to 50 watts of sound output. The innovative 4-way speakers plus integrated subwoofer create a high quality sound that projects in all directions at the same time. 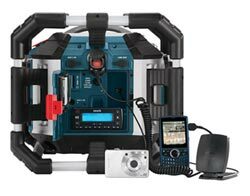 The PB360D includes such step-up features as a SIRIUS satellite radio port, 4-way GFCI power outlets, a remote control, and backlit control panel. It's also available in a standard version (model PB360S) that excludes these features. See a comparison of the two models below. 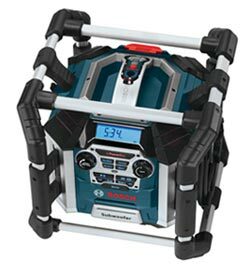 It also includes an AM/FM radio with 20 FM and 10 AM presets, 4 preset and custom equalizer settings, protective roll cage, and 12-volt DC adapter. 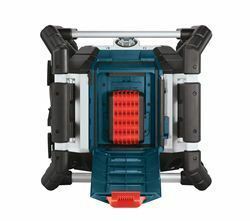 Operate the Power Box 360 with Bosch 14.4V-18V lithium-ion batteries, or charge them with the unit's built-in battery charger. 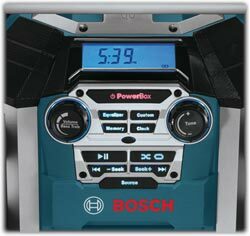 The integrated Digital Media Bay includes a powered USB port and SD/MMC card slot compatible with MP3 and WMA files stored on optional cards, as well as two auxiliary inputs for connecting MP3 players, CD players, or portable satellite receivers via a 3.5mm stereo mini jack. 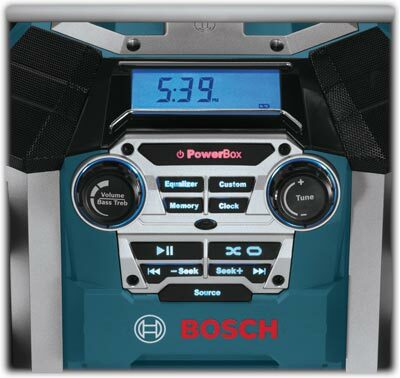 The Bosch PB360D job-site radio with backlit controls (see larger image). Rugged aluminum/rubber roll cage (see larger image). Plug in MP3 and CD players into the AUX ports, connect optional SIRIUS Radio devices, and charge all your peripherals (see larger image). (batteries not included; see larger image). * Only compatible with SIRIUS Dock & Play devices (Starmate 3, 4 & 5; Stratus 4, 5 & 6; Stiletto 2). Device, antenna, and subscription required for SIRIUS Satellite Radio playback (not included). Each sold separately.